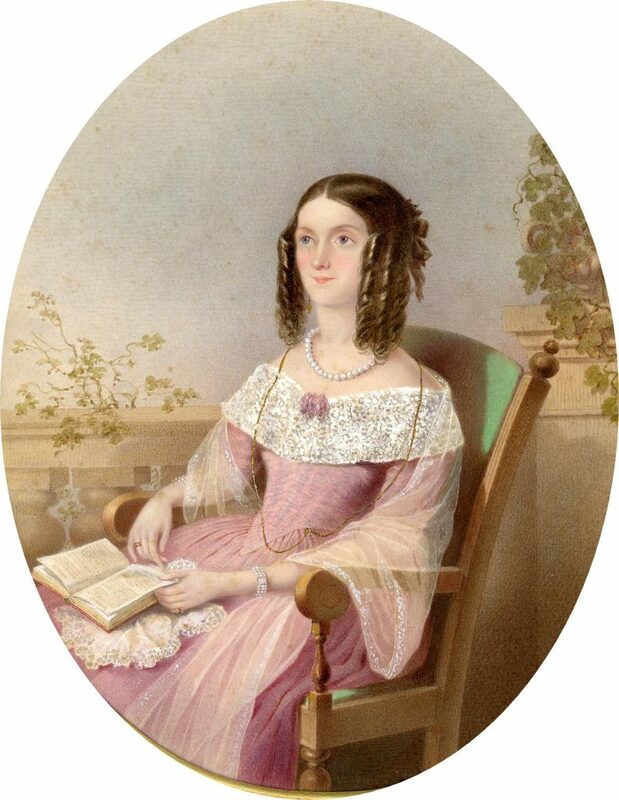 This attractive portrait depicts Miss Esther Bonnell seated in an armchair and relaxing on a terrace with her book. 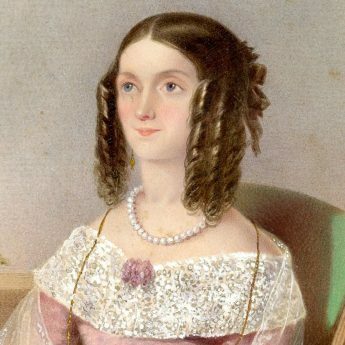 Esther is wearing an elegant pink dress with a pointed bodice and fine lace pèlerine decorated with a pink rose on her corsage, a voile wrap over her shoulders. She has pearl jewellery as well as gold drop earrings and a long gold chain and her hair is fashionable arranged in long ringlets. 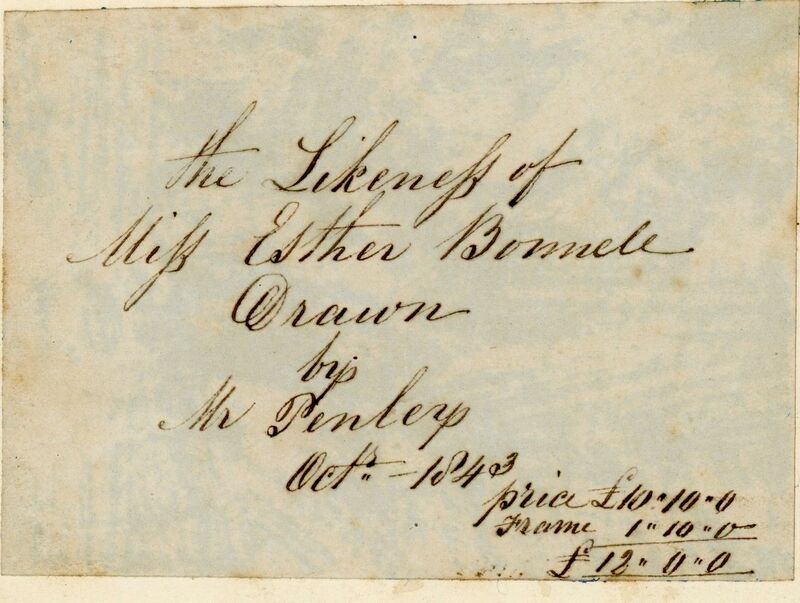 Born in 1807, Esther was the daughter of James Bonnell who inherited Pelling Place in Old Windsor from Mary Anne Harvey Bonnell (who was actually the original recipient of this watercolour). 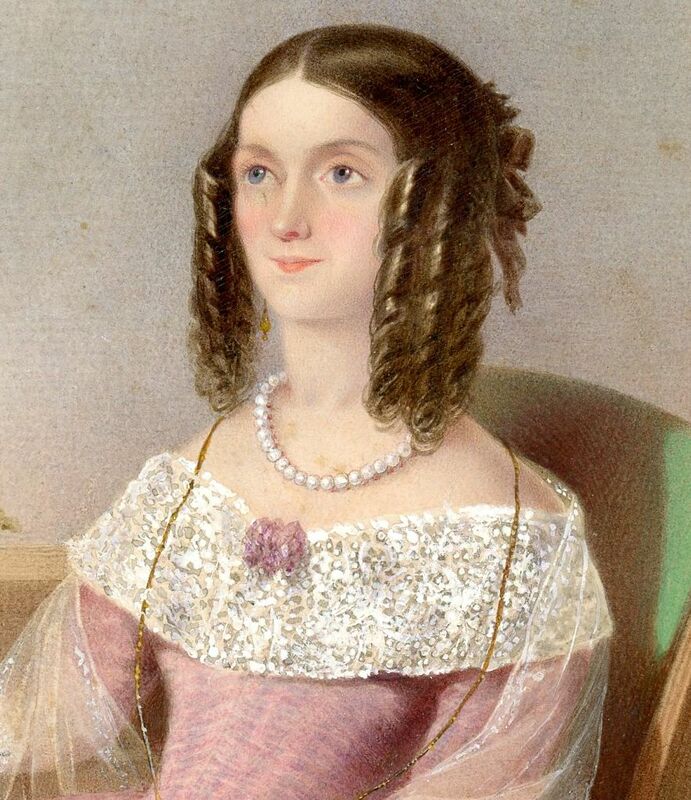 Her brother, also named James, was a courtier to Queen Victoria. She died unmarried in 1883 and was buried in Northwood Cemetery on the Isle of Wight. 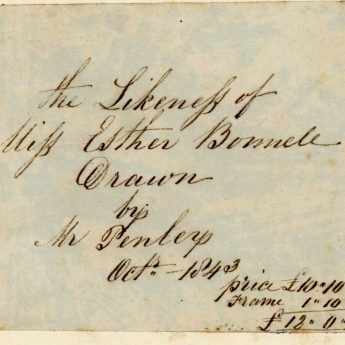 The watercolour is backed with the artist’s signed receipt – ‘the Likeness of / Miss Esther Bonnell / Drawn / by Mr Penley / Octr 1843’. The painting cost £10 10s with an additional £1 10s for the frame. 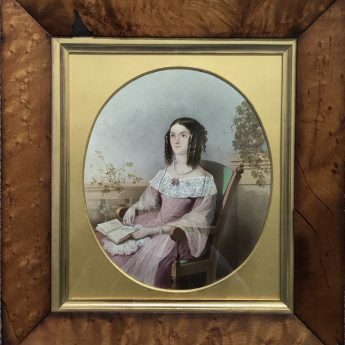 Having been discovered without a frame, it is now presented with an oval card mount within a handsome period bird’s eye maple veneer frame with a gilt slip. The watercolour has a little light browning to the sky area but is otherwise in fine condition. 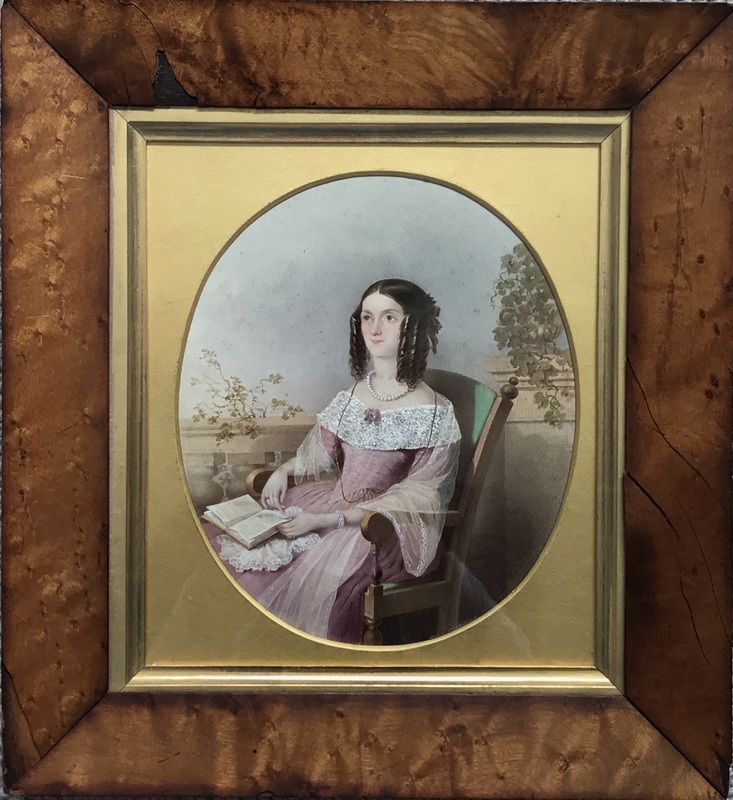 The frame has some old losses and cracking to the veneer but nothing to unduly distract from the beauty and charm of the portrait. Although better known as a landscape artist, Aaron Edwin Penley (1806-1870) also worked as a miniaturist in Manchester and Cheltenham. 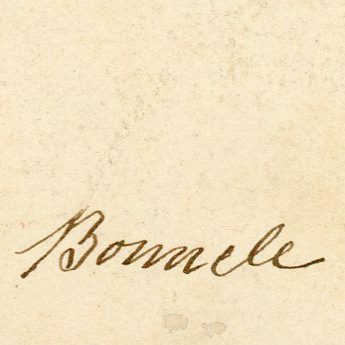 He was appointed Water-Colour Painter in Ordinary to William IV and taught drawing at Woolwich military college.